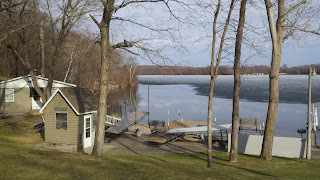 Yesterday was the first gorgeous spring day of 2011 at East Silent Resort. Despite 60 degree weather, however, the ice remained. There was enough water for the Loons to land apparently. If you look very carefully at the first photo you’ll see a Loon in the water. It is just to the right of the tallest dock legs. Today’s weather wasn’t as delightful. 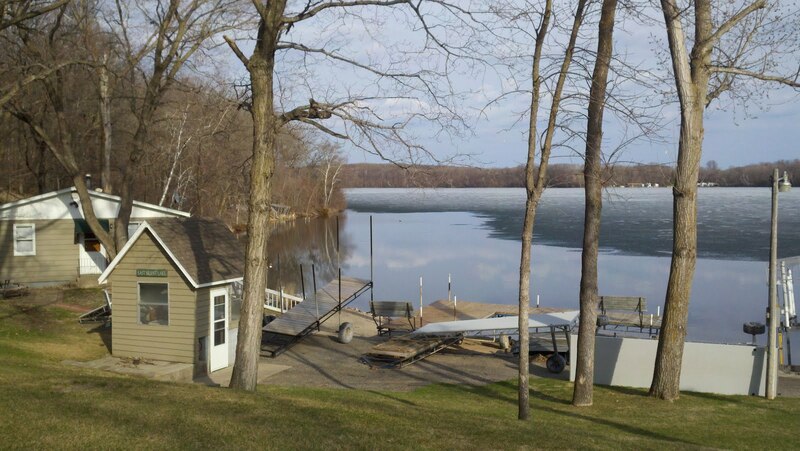 But…you’ll be glad to know the ice is finally gone. Set the alarm. Grab the binoculars. Put on good walking shoes. 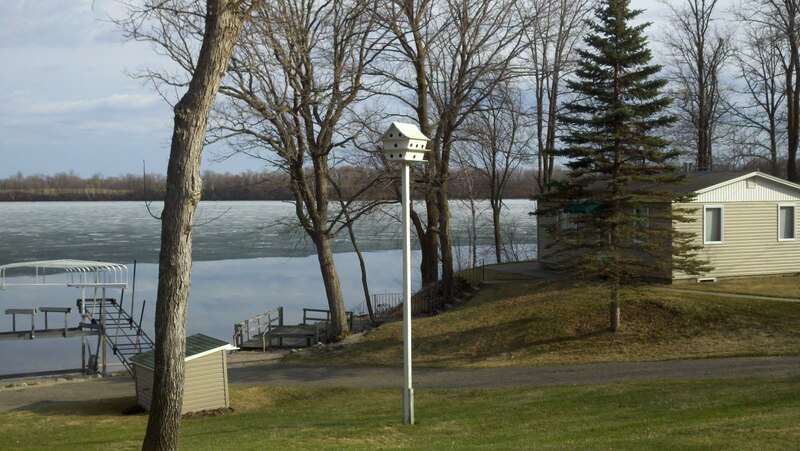 You don't want to waste any time in birders' paradise - Detroit Lakes, Minnesota. More than 250 species of birds live in Becker County. Why? Because the Detroit Lakes area is in the heart of a transition zone of tall grass prairie, northern hardwood and coniferous ecosystems. Serious birders flock here each spring for the annual Detroit Lakes Festival of Birds. The 14th Annual Festival of Birds is approaching on May 19-22, 2011. This is the Northwest Minnesota Birding Report for Thursday, April 21, 2011 sponsored by the Detroit Lakes Regional Chamber of Commerce. You may also hear this report by calling (218)847-5743 or 1-800-433-1888. Migration is picking up and temperatures also are getting warmer. Tonight we are getting a little rain, with emphasis on the little. Even better weather is forecast for the weekend. Brad and Dee Ehlers reported that there are many GREAT EGRETS and DOUBLE-CRESTED CORMORANTS at the rookery in Fergus Falls, and the best place to photograph them is across from the Dairy Queen. The first YELLOW-RUMPED WARBLER was seen in Fergus Falls on April 18. Tom and Sheryl Smith observed TREE SWALLOW, CHIPPING SPARROW, and FOX SPARROW on April 18. In Becker County , Dave and Betty Hochhalter reported NORTHERN FLICKER, EASTERN BLUEBIED, and RED-BELLIED WOODPECKER in Detroit Lakes on April 16. In Hubbard County, a TURKEY VULTURE was seen by Dave and Betty on April 16. Beau Shroyer was at Lake Sallie on April 16, where he reported large numbers of ducks of several species. Among the other species seen in Otter Tail County were RED-NECKED GREBE, HORNED GREBE, PIED-BILLED GREBE, OSPREY, NORTHERN GOSHAWK, EASTERN PHOEBE, and GOLDEN- CROWNED KINGLET. Steve Midthune observed RING-NECKED DUCK, BUFFLEHEAD, and FIELD SPARROW on April 20. A GREAT EGRET flew up from the banks of the Red Lake River here in Pennington County tonight as I ate supper. On April 20 a COMMON LOON was seen in the river at the junction of the Red Lake and Thief Rivers. Maggie Anderson reported from Agassiz NWR , Marshall County, that 2 COMMON LOONS were seen on Headquarters Pool on March 15. On April 18, RED-NECKED GREBES were seen, and on April 19, PIED-BILLED GREBE and a few GREATER YELLOWLEGS were seen. Present in small numbers now are nearly every species of ducks that are commonly seen on the refuge. On April 17 I saw 7 HOODED MERGANSERS and a BELTED KINGFISHER at the CR 7 bridge on the west end of the refuge, and several ROUGH-LEGGED HAWKS were seen along the county road. Katie Haws reported a good variety of ducks, and many TUNDRA SWANS at the rice paddies in Clearwater County on April 18. SANDHILL CRANES, SHARP-TAILED GROUSE, and TURKEY VULTURES were also seen. Larry Wilebski reported a GREATER WHITE-FRONTED GOOSE on April 17, a mile west and a miles north of Lancaster in Kittson County on April 17. Wes Bailey in Lake of the Woods County on April 18, reported RED CROSSBILL, and EVENING GROSBEAK. A lone SNOW BUNTING was seen along the Faunce -Butterfield Road about six miles east of Norris Camp . Thanks to Beau Shroyer, Brad and Dee Ehlers, Dave and Betty Hochhalter, Katie Haws, Larry Wilebski, Maggie Anderson, Steve Midthune, Tom and Sheryl Smith, and Wes Bailey for their reports. Please report bird sightings to Jeanie Joppru by email, no later than Thursday each week, at [email protected] OR call the Detroit Lakes Chamber's toll free number: 1-800-542-3992. Detroit Lakes area birders please call 847-9202. Please include the county where the sighting took place. The next scheduled update of this report is Thursday,April 28, 2011. 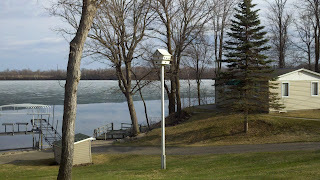 Perham Lakeside golf course will be opening up this Friday, April 15, 2011. Please call ahead and make your tee time for Friday. Wildflower is opening on Thursday, April 14. Tee times start at 9:00 a.m. each day. $25 per person – cart included (rate thru May 1). This is the Northwest Minnesota Birding Report for Thursday, April 14, 2011 sponsored by the Detroit Lakes Regional Chamber of Commerce. You may also hear this report by calling (218)847-5743 or 1-800-433-1888. After a week long teaser, the weather in the northwest is reverting to late fall, early winter conditions with snow forecast for tomorrow. Judging from the bird's activities, maybe it won't be so bad as all are very busy preparing to raise families. Every day more and more species are returning. Connie Cox reported from Clearwater County. On April 6 , she saw WILD TURKEYS displaying along MN 92. At Itasca SP on April 8, there was RUFFED GROUSE, and EASTERN PHOEBE. 15 EVENING GROSBEAKS and several PURPLE FINCHES are visiting her feeder 5 miles north of the park. On April 11 WOOD DUCKS came back to the park. Maggie Anderson reported from Agassiz NWR this week. Species mentioned included GREAT EGRET. DOUBLE-CRESTED CORMORANT, SHARP-SHINNED HAWK, COOPER'S HAWK, AMERICAN COOT, WILSON'S SNIPE, BELTED KINGFISHER, FOX SPARROW, AMERICAN TREE SPARROW. AMERICAN WHITE PELICANS appeared on April 11, and FRANKLIN'S GULLS, AMERICAN BITTERN, BLACK-CROWNED NIGHT HERON, and WOOD DUCK on April 12. A MARBLED GODWIT was seen southeast of the refuge. A good variety of ducks of most of the common species has returned to the refuge. On April 7 , Shelley Steva found an AMERICAN BLACK DUCK in the ditch along Pennington CR 3 near the Polk County line. Here at our place near Thief River Falls, on April 9, WOOD DUCK, COMMON GOLDENEYE, and 100's of DARK-EYED JUNCOS were seen. On April 9, WILD TURKEYS were seen displaying along CR 7 and an EASTERN BLUEBIRD was at the same spot. April 10 brought FOX SPARROW, April 13 a YELLOW-BELLIED SAPSUCKER, and April 14 , HOODED MERGANSER, AMERICAN COOT, and AMERICAN TREE SPARROW. During the course of an owl survey, along the Pennington- Red Lake County line on April 11, I heard RUFFED GROUSE, SANDHILL CRANES, KILLDEER, and AMERICAN WOODCOCK in Red Lake County. Sandy Aubol in Polk County reported TUNDRA SWANS, FOX SPARROW, and AMERICAN TREE SPARROW on April 8. Donna and Leon Thoreson this week saw 350 TUNDRA SWANS, a variety of ducks, and BELTED KINGFISHER in the county on April 10. Sandy Aubol found a SHORT-EARED OWL in a tree across from the East Grand Forks wastewater treatment ponds on April 12. Other species included HOODED MERGANSER, and AMERICAN KESTREL. Shelley Steva saw a BREWER'S BLACKBIRD in East Grand Forks on April 7. I heard AMERICAN WOODCOCKS on the night of April 11 near the intersection of Pennington, Polk, and Red Lake Counties west of Pennington CR 12. Gary Otnes found a BLACK-BILLED MAGPIE in Mahnomen County on April 9. Marshall Howe reported all three species on mergansers - HOODED MERGANSER, COMMON MERGANSER, and RED-BREASTED MERGANSER at Little Sand Lake on April 9; on that day a HOARY REDPOLL appeared at his feeder near Dorset. Alma Ronningen in Otter Tail County reported EASTERN PHOEBE on April 12, GOLDEN-CROWNED KINGLET, WHITE-THROATED SPARROW, and FOX SPARROW on April 13, and still some COMMON REDPOLLS on April 14. Bob Dunlap with a group of other birders found an AMERICAN GOLDEN-PLOVER in southwest Otter Tail County, and 25 BOHEMIAN WAXWINGS in Deer Creek on April 8. Brad and Dee Ehlers observed AMERICAN WHITE PELICAN, COMMON LOON, PURPLE MARTIN, and PIED-BILLED GREBE on April 8, GREAT EGRETS, and CHIPPING SPARROW on April 10. OSPREY returned to the nest site on April 14. Tim Smith reported AMERICAN KESTREL, and LAPLAND LONGSPUR on April 14. Large numbers of waterfowl were seen by Bob Dunlap and his group in southern Wilkin County on April 10. Gary Otnes observed GREATER SCAUP, TUNDRA SWAN, and CALIFORNIA GULL in the county on that day. Thanks to all the folks, too numerous to mention, who sent in their sightings this week. Please report bird sightings to Jeanie Joppru by email, no later than Thursday each week, at [email protected] OR call the Detroit Lakes Chamber's toll free number: 1-800-542-3992. Detroit Lakes area birders please call 847-9202. Please include the county where the sighting took place. The next scheduled update of this report is Thursday, April 21, 2011. This is the Northwest Minnesota Birding Report for Thursday, April 7, 2011 sponsored by the Detroit Lakes Regional Chamber of Commerce. You may also hear this report by calling (218)847-5743 or 1-800-433-1888. Spring seems to have finally arrived. The first wave of migrants is here in force. Species reported in most counties this week, and probably present in all counties of the northwest include CANADA GOOSE, BALD EAGLE, NORTHERN HARRIER, RED-TAILED HAWK, ROUGH-LEGGED HAWK, AMERICAN KESTREL, MERLIN, SANDHILL CRANE, AMERICAN ROBIN, DARK-EYED JUNCO, RED-WINGED BLACKBIRD, COMMON GRACKLE, and WESTERN MEADOWLARK. Gary Otnes in Otter Tail County reported several thousand waterfowl in Western Township on the first few days of April including SNOW GOOSE, GREATER WHITE-FRONTED GEESE, TUNDRA SWANS, and COMMON MERGANSERS. More birds were found at Orwell Reservoir . Two ROSS'S GEESE and 3 GREAT EGRETS were also seen there. Elsewhere in Otter Tail County on April 4 were PIED-BILLED GREBE, FOX SPARROW, and PURPLE FINCH. Brad and Dee Ehlers reported EASTERN PHOEBE on April 3, DOUBLE-CRESTED CORMORANT, and HERMIT THRUSH on April 4. Alma Ronningen observed TURKEY VULTURE and AMERICAN WHITE PELICAN on April 7. Marshall Howe in Hubbard County reported CANVASBACK on April 1. On April 7, he saw SHARP-SHINNED HAWK, RED-SHOULDERED HAWK, MERLIN, YELLOW-BELLIED SAPSUCKER, and YELLOW-RUMPED WARBLER in the county. Beau Shroyer reported a flock of about 300 BOHEMIAN WAXWINGS on April 7 in trees along Washington Ave in Detroit Lake, Becker County. Steve Midthune saw a HARRIS'S SPARROW along CR 9 and a HOODED MERGANSER at Hamden Slough NWR. Gary Otnes saw a RED-SHOULDERED HAWK at Dunton Locks County Park on April 2. Dave and Betty Hochhalter reported AMERICAN ROBIN on March 31. Kathy Bresee in Moorhead , Clay County, reported 100's of AMERICAN ROBINS, NORTHERN CARDINAL , BROWN CREEPER, and DARK-EYED JUNCO on April 3. Mel and Elaine Bennefeld found an EASTERN BLUEBIRD at the Pondorosa Golf Club on April 5. Shelley Steva observed a GREAT BLUE HERON near Erskine in Polk County on April 1. A NORTHERN FLICKER was reported by Donna and Leon Thoreson at Climax on April 4. Mike Christopherson in Crookston reported MERLIN, WHITE-THROATED SPARROW, and FOX SPARROW on April 5. Sandy Aubol saw a YELLOW-BELLIED SAPSUCKER on April 4, and a kettle of 52 hawks, mostly RED-TAILED HAWKS on April 6. A TURKEY VULTURE was also seen over East Grand Forks. In Red Lake County, Shelley Steva saw a MERLIN and a COMMON GRACKLE in Oklee on April 4, and a WESTERN MEADOWLARK near Plummer on April 6. In Pennington County, I heard SANDHILL CRANE and KILLDEER on April 5. Maggie Anderson reported from Agassiz NWR in Marshall County this week. Many of the same species mentioned in other counties arrived there also. In addition she reported NORTHERN PINTAIL , LESSER SCAUP, COMMON MERGANSER, BUFFLEHEAD, EASTERN PHOEBE, and RED-WINGED BLACKBIRD. Wes Bailey reported a BLACK-BACKED WOODPECKER off the Thompson Forest Road in Roseau County near the Bemis Hill Campground on April 5. Other species seen in Roseau County included GREAT BLUE HERON, SANDHILL CRANE, and RED CROSSBILL. In Lake of the Woods County, Wes saw SPRUCE GROUSE in the Beltrami Island State Forest, SANDHILL CRANE, KILLDEER, AMERICAN WOODCOCK, GREAT HORNED OWL, BARRED OWL, and PURPLE FINCH this week. Thanks to all the folks, too numerous to mention who sent in their sightings this week. Keep up the good work. Please report bird sightings to Jeanie Joppru by email, no later than Thursday each week, at [email protected] OR call the Detroit Lakes Chamber's toll free number: 1-800-542-3992. Detroit Lakes area birders please call 847-9202. Please include the county where the sighting took place. The next scheduled update of this report is Thursday, April 15, 2011. This is the Northwest Minnesota Birding Report for Thursday,March 31, 2011 sponsored by the Detroit Lakes Regional Chamber of Commerce. You may also hear this report by calling (218)847-5743 or 1-800-433-1888. Spring seems to be on the way, and snow is slowly melting, lakes are appearing where there were none, and folks are anxiously watching the weather forecast hoping that no more precipitation falls. So far the melt has gone well, but as the weather warms that could change. There is still a lot of snow in the northwest, although flat fields in the open are rapidly turning brown. Most of the first wave of migrants has arrived, and now we await the opening up of the rivers and lakes for the ducks to arrive. All of the common raptors were reported this week in many counties of the northwest. A MERLIN was seen in Thief River Falls, Pennington County, as recently as tonight on my way home from work, and on March 29 a small flock of BOHEMIAN WAXWINGS flew over our yard. On March 30, I heard the first singing AMERICAN ROBIN in the yard. Sandy Aubol in Polk County at East Grand Forks reported a lone COMMON REDPOLL still coming to the feeder on March 26. 25 BOHEMIAN WAXWINGS and a NORTHERN CARDINAL were seen on March 26, MERLIN, SHARP-SHINNED HAWK, and MOURNING DOVE on March 29, and a PIED-BILLED GREBE on the 30th. Matt Mecklenburg was birding in Clay County on March 27 where he saw all the usual raptors including a PEREGRINE FALCON. At the Moorhead wastewater treatment ponds there was a great variety of waterfowl including NORTHERN PINTAIL and AMERICAN WIGEON. As might be expected, Otter Tail County had the most sightings, being among the most southerly counties of the northwest. Gary Otnes saw an AMERICAN WOODCOCK along his driveway on March 28. Steve Millard had a visit from a red phase EASTERN SCREECH OWL to his yard on March 29. Alma Ronningen reported SANDHILL CRANES on March 27, AMERICAN KESTREL, MOURNING DOVES and DARK-EYED JUNCO on March 29. Brad and Dee Ehlers reporting on March 28, observed RED-BREASTED MERGANSER, GREAT BLUE HERON, EASTERN BLUEBIRD, and WESTERN MEADOWLARK on March 28. Thanks to Alma Ronningen, Brad and Dee Ehlers, Brian Nelson, Connie Cox, Gary Otnes, Gary Tischer, Matt Mecklenburg, Sandy Aubol, and Steve Millard for their reports. Please report bird sightings to Jeanie Joppru by email, no later than Thursday each week, at [email protected] OR call the Detroit Lakes Chamber's toll free number: 1-800-542-3992. Detroit Lakes area birders please call 847-9202. Please include the county where the sighting took place. The next scheduled update of this report is Thursday, April 7, 2011.